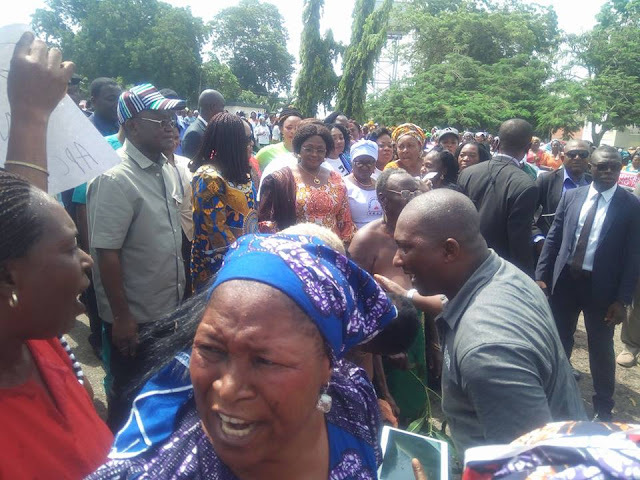 Benue women of different groups and associations across the state on Thursday gathered at the Benue State Government House, otherwise known as the People’s House, Makurdi in support of Governor Samuel Ortom and his wife, Eunice Ortom on the implementation of the anti-Open grazing law. The women, most of them stormed the government house bare-chested to thank the governor for taking the bold step. The governor, who was on ground to personally receive the women, thanked them for their support for the APC-led government in the state. He said the implementation of the anti-Open grazing law was a beginning of new things to come in Benue State. DAILY POST reports that Ortom yesterday announced prohibition of open grazing in the state. The governor, while calling on everyone residing in Benue State, who are into cattle or livestock business to abide by the new law, said anyone found flaunting the newly enacted law would be labeled a criminal.